Text messages warning of the dangers of London's "clip joints" will be sent to visitors as they approach the venues. 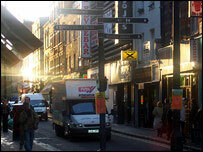 Westminster City Council hopes the messages will stop tourists being exploited in Soho, central London. It said clip joints lure people in with false promises of "adult entertainment" but once inside security staff demand hundreds of pounds from visitors. The message reads: "£5 to get in, £500 to get out. Criminals operate some of the hostess bars in Soho." It continues: "Don't enter without knowing what you'll get for your money." Clip joints are unregulated and do not need a license because they do not sell alcohol or provide any entertainment. The council says visitors who refuse to pay the clip joint's high bill for the company of its hostess are often frog-marched to a cash machine by the venue's security staff. It says three clip joints remain in operation in Soho, largely because embarrassed or intimidated visitors rarely complain to police. The council will use Bluetooth technology to send its warning message to anyone with a compatible mobile phone or palmtop computer within 100ft (30m) of one of the venues. Councillor Audrey Lewis said clip joints "cause a great deal of distress to local residents, workers and visitors and we would like nothing more than to see them gone". She said: "By employing the latest technology and having a warning message sent directly to mobile phones advising people not to enter these sleazy and illegal clubs, we hope to thwart their activities every step of the way." Since last November the council has distributed leaflets around the area encouraging tourists to avoid the venues.